Home / Posts Tagged "Grand Central Hotel"
Like any major city in the UK at the time, Belfast had a wide range of hotels catering for all budgets and markets. The most prestigious of these were grand hotels found in the city centre, predominately on Royal Avenue, the premier address in the city, although many smaller commercial hotels also thrived around the railway termini, particularly the GNR on Gt. Victoria Street. In this study, we will look at grand hotels at the top end of the market, which were designed for and patronised by the successful, the rich and the famous. Without question, the Grand Central Hotel was the finest hotel in the city, if not Ireland, when it opened for business on Thursday 1st June 1893. With 200 rooms over 5 floors, it was the brainchild of one of the city’s leading property developers, John Robb, who also operated one of the largest department stores in the city on Castle Place. The name came about from the original plan for the site, a central railway terminus, based on the Grand Central in New York. When the hotel opened it boasted every wonder of the age, with electricity generated in the basement which provided lighting throughout and which powered the elevators which took guests to every floor. 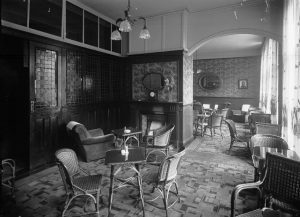 The public rooms of the hotel were situated on the first floor, overlooking Royal Avenue, and comprised lounges, a smoke room, billiard room, coffee room and several private dining rooms. 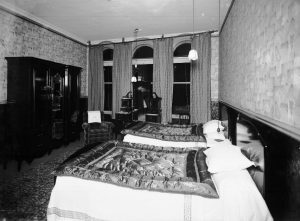 The finest suites were located on the second floor, and it was in these rooms that guests such as King Leopold of Belgium; Winston Churchill; Mario Lanza and Al Jolson stayed during their visit to the city. 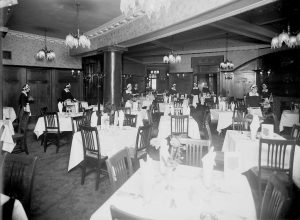 The hotel also played host to the cream of Ulster Society where the grand ballroom provided banqueting facilities for some of the most important events in the city, such as the official lunch celebrating the launch of the White Star Liner, RMS Titanic, in 1912. It was therefore with a great deal of dismay that the owners of the hotel learned that they were being served with a requisition order issued by the Imperial government in Whitehall, ordering the hotel to be vacated for use during the first world war which broke out in 1914. The Robb family were forced to close the business, auction off all the contents, and hand the keys over to the War Office in London. It was only after the building remained empty for several months that the awful truth came out – a requisition order meant for the Grand Central Hotel in Bristol had been sent to Belfast by mistake! 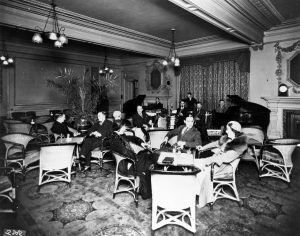 By that time the damage had been done and faced with the daunting task of re-furnishing the entire hotel, the Robb family decided to sell the business to a consortium led by the Scotch whisky distiller, John Grant, who reopened the hotel in 1927. Today the site of the hotel is occupied by Castlecourt Shopping Centre. 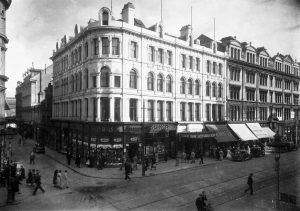 The Metropole Hotel was located at 95-101 Donegall Street and 2-10 York Street, taking full advantage of a commanding corner site extending round into York Street and looking down Lower Donegall Street and Royal Avenue. Opened as the Queen’s Arms Hotel in 1850, its name was changed in 1890 by the then owners, the McGlade Brothers, no doubt to compete with it’s main competitor the Grand Central further down Royal Avenue. 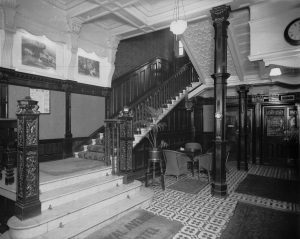 The hotel was situated over four floors with its main entrance with a grand canopy on York Street, and a restaurant entrance on Donegall Street. It followed an irregular floor plan which allowed it to have lengthy frontages onto both thoroughfares. Although it opened in the mid nineteenth century, it appears to have reached its zenith in the Edwardian era, when it changed ownership several times. 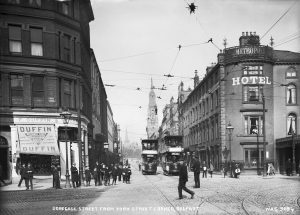 Although it did not achieve the same ‘celebrity’ status as its grander sisters on Royal Avenue (qv), the Grand Metropole was none the less an imposing, significant and important part of Belfast’s social history. 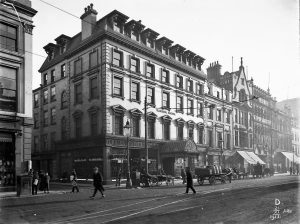 It received much business from the nearby LMS railway terminus on York Road, to which hospitality carriages would have been sent to pick up guests, the grand hotel was also located on two of the busiest tram routes, which terminated at Castle Junction in the city centre, giving easy access to all parts of the city. The hotel continued to flourish until 1929, when it was demolished to make way for a modern Art Deco retail building opening as Berris’s Walk Around Store in 1930. This building was subsequently demolished in 2017 to make way for the development of the Ulster University which will extend along the length of York Street. The Midland Station Hotel opened for business in 1898 and was in the style of the grand Victorian railway hotels of the period. It was designed by the leading railway architect, Berkeley Deane Wise for the Belfast & Northern Counties Railway Co and operated by the railway company in order to capture those passengers arriving into Belfast by rail and sea (at the nearby docks) and also as a base for touring the Antrim Coast and Glens and County Donegal. The competing railway companies built large hotels across the province, such as the Slieve Donard at Newcastle, the Northern Counties, Portrush and the Laharna at Larne. 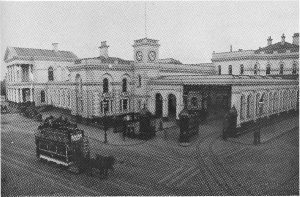 As can be seen from the photograph, the hotel was directly attached to the impressive railway terminus buildings on York Road. The Corporation tramway also served the railway terminus directly connecting guests of the hotel to all parts of the city. The clientele would have been commercial and tourist in nature, but none the less, well to do, as many less expensive hotels existed around the area. The hotel was completely destroyed in the Blitz of Belfast in Easter 1941, along with much of the original railway terminus. It was however rebuilt, as the Midland Hotel and thrived in what later became a rather isolated part of Belfast until the 1980s when it was converted to use as offices by the Hastings Hotel Group. The building was demolished in 2017. Constructed between 1882 and 1884, and designed by architect Thomas Jackson in the Italianate style, the Royal Avenue Hotel was the first hotel on the city’s main thoroughfare beating its main competitor (The Grand Central) to the title of Belfast leading address by nine years. A four-storey building with round headed dormers and a rounded corner to Rosemary Street, it originally had 32 bedrooms – this was later expanded to 118 as the hotel grew in importance. 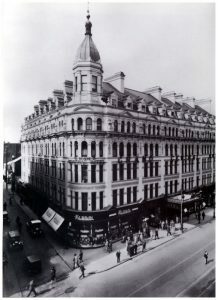 It was a property development devised by several of Belfast’s most successful merchants and was, until the opening of the Grand Central opposite, the most luxurious and centrally located hotel in the city. Synonymous with style and class it was typical of Victorian hotels found in city centres throughout the country. The Royal Avenue was a much more intimate hotel than the Grand Central which was majestic in size and scale. The main entrance was onto Royal Avenue, with the public rooms overlooking the main thoroughfare and Rosemary Street. The hotel continued to thrive until the early 1970s, when, with the arrival of civil unrest in the city, the business suffered a dramatic reduction until the hotel was destroyed in an accidental fire in 1984 and subsequently demolished. Opened on Donegall Place in 1868, it was the brainchild of William J Jury, a Whiskey magnate and proprietor of Grand Jury Irish Whiskey which was exported around the world from Chichester Street, Belfast. An additional two floors of bedrooms were added in 1868, at a cost of £2000! Jury went on to open hotels (under his own name) on Dame Street in Dublin and in Cork City. These continued to expand as the Jury’s Hotel group and the business still trades today AS Jury’s Inns across the UK and Ireland. The Imperial remained one of Belfast’s oldest and busiest hotels until it closed in 1948, being replaced by a modern retail building in 1950.